Luka Arlexi has never believed in luck. Perhaps this is because, to her thinking, the good kind has generally eluded her. which has three agents going after her (one for each name). Born Alexandra Romanov to two members of the Russian underground, much of Luka's early life remains a blur to her. She has vague memories of spending quite a bit of time sick in bed, feeling weak, and being almost constantly attended by her mother. Both of her parents were delighted by her later recovery, though their happiness was short-lived. All three were taken into custody when Luka was eight. Her father was taken away to a reeducation camp, while she and her mother were sent to be subjects for the local research and development team. Due to her mother's quick-thinking and the fact that Alexandra was still a scrawny child, she was able to crawl out through the ventilation system (which was, in fact, too small for any reasonably built adult to get through, but not a recently-ill child). She was not, however, able to long evade capture. She was nearly hanged for various crimes against the state, though the MIGDMP order that would have come to stave off her execution never made it since she was rescued by her great uncle Matthew Alderidge and her second-cousin Daniel Alderidge. Her admiration for both of them was understandable, if excessive. Daniel renamed her Luka Arlexi, after a distant relation of his mother, who had disappeared some time before. 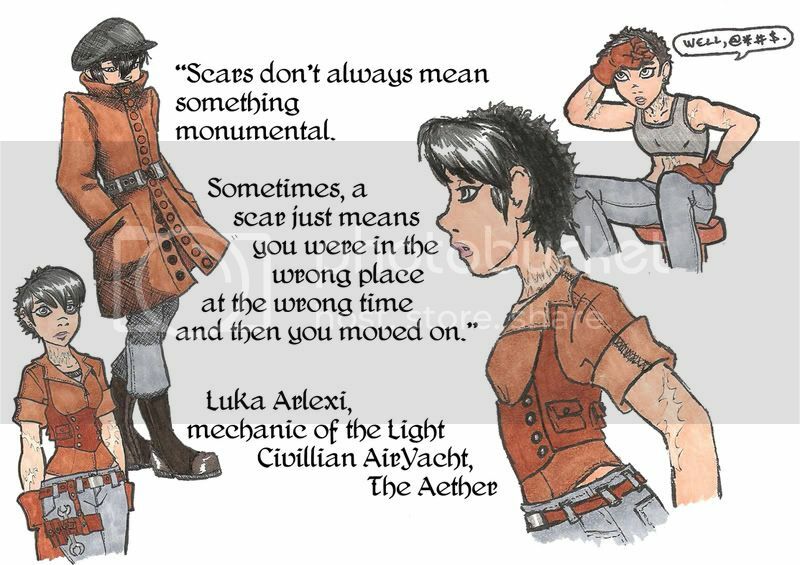 Reborn as Luka, she took to wearing scarves and high-collared shirts to hide the scarring on her neck. Once Daniel had taught her to read, Luka went through all the books she could find on machines and hydrodynamics. He seemed slightly disappointed that his books on anatomy and chemicals held little interest for her, though he never tried to discourage her. Matthew was delighed to have someone show interest in his work, and the fact that she bore an uncanny resemblance to her grandmother, Amelia (who had been Matthew's sister), certainly did nothing to diminish his affection for her. Though she became something of a staple around Matthew's workshop, she also attended school under her new name. When she was 14, she made the acquaintance of a fellow student (who was also the son of a local magistrate) whose attentions she enjoyed for some time. He believed, as did Daniel, that her interest in mechanical devices and applied hydrodynamics would fade into something more "suitable" in time, though what each believed that suitable interest to be varied. Matthew believed otherwise. He consistently gave her more work in and around the shop, and he took her interest seriously. This, perhaps more than anything else he could have done, encouraged her to involve herself in matters mechanical. Her choice became most evident when, at 16, she attempted to salvage the engine from an abandoned Ferroustech Mark IV steam armor. Lo and behold, the occupant had tried to use the self-destruct mechanism, but it had failed. It wasn't until Luka was guiding the engine out that the armor detonated, throwing her back several yards and sending hot shrapnel tearing through her arms and torso. If she hadn't been found quickly, and treated by Daniel, she would have lost the use of her left arm entirely, not to mention the damage to her internal organs. She would end up hospitalized, but thanks to Daniel's care she made a full recovery. Her paramour saw this as proof positive that she was being foolish, and should obviously give up this work entirely. He even offered to get his father to pay for cosmetic surgery to remove her scars, including the one around her neck. Luka took this poorly, going so far as to tell him she never wanted to see him again, which he also took poorly. She returned to her work in the shop with even greater fervor, sooner than Daniel wished, and took to working in jeans, gloves, and a rather brief undershirt, stating that perhaps if people saw her scars, they would take her more seriously. It had the secondary effect of making her quite off-putting, except to the men and women she and her great-uncle worked with. Due in part to some of Matthew's more clandestine activities, as well as his acceptance of Luka's somewhat reckless passion for her work, Daniel left on bad terms with him, once he was sure Luka had recovered. Though Luka was distressed by the bad blood between them, she saw Daniel's choice as being similar to her own, and did not hold it against him. She wished him well as he went off for more extensive medical training than he could receive in the area. When Matthew died several years later, however, Luka was visited by a member of MIGDMP who politely (and then later, not so politely) asked her to submit herself to the eugenics department. He did not take her refusal well, and after being drugged and kidnapped she found herself for the second time having to escape from incarceration. She did so, with some help from the people who had worked for Matthew, and it was with a heavy heart that she sold the shop and the junkyard with it, preparing to leave the place she most strongly associated with home. Partly to help hide, and partly to mourn Matthew, she cut off most of her hair. Almost immediately after the sale went through, however, Daniel returned. Luka gave him the money, saying (truthfully) that Matthew hadn't wanted Daniel to be indebted to the state. She had been injured in her escape, but dismissed it as having been work she did for The Fox. Daniel, in the process of patching her up, mentioned that she should go in for formal genetic testing. She knew he had no idea of what had happened, but the suggestion made her so angry and frightened that it was obvious to him she was distressed, and her refusal to go or discuss her reasoning led to the first and only real argument they would ever have. It was also the last time she would see him for several years. Luka headed for Russia, with papers in a third name: Nastaja Yuriy. She tried to find someone, anyone who had been connected to her parents, but ended up wandering aimlessly for a few weeks, working odd jobs (including one instance where she donated blood) and finding nothing. She ended up leaving with a group of refugees, some of whom had shown her kindness, though an attack by Turkish Automatons looked to leave her disappearing much like her previous namesake. She has no idea why MIGDMP wants her "genetic donation" so badly. They've never offered to explain, and she's never asked. She does know that, somehow, all three of her names ended up on their list, but no one sent to retrieve her seems to know that she has more than one name… so far.